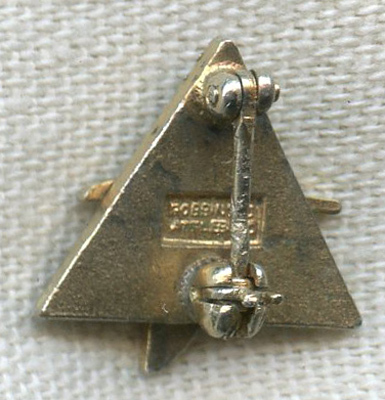 1950s North American Aviation (NAA) 3 Years of Service Pin by Robbins Co.
ARTIFACT: This is a circa 1950s lapel pin for three years of service with North American Aviation (NAA), a company renowned for producing notable aircraft such as the B-25 Mitchell bomber and the P-51 Mustang fighter plane. The pin is by Robbins Company of Attleboro, Massachusetts and has a semi-precious stone chip. CONSTRUCTION/MATERIALS: Enameled brass, semi-precious green stone chip. CONDITION: 8- (Very Fine-Excellent): The pin has some light wear.